Well it did seem to good to be true didn't it. Last year's surprising study showing remarkably high rates of XMRV retrovirus in chronic fatigue syndrome (CFS) has now been challenged by two British studies (1,2) which found absolutely no evidence of such an infection. It's a transatlantic spat between a private research institute from the States and more regular academic folk from across the pond,who accuse each other of sloppy lab technique. The results are not even close, only one of them can be right. Unfortunately, I'm leaning towards the skeptic's corner. The breakthrough study was simply to good to be true. As I mentioned in the previous XMRV post, I can't imagine such clean results in what is likely an untidy inhomogenous disease. It's a real downer though, because the same group tantalized us with preliminary evidence suggesting that the same virus was found in fibromyalgia patients. Still, the whole world laughed at prions and helicobacter, so while I vote with the skeptics, I cheer for the XMRVers. As is often the case, this story unfolds at In The Pipeline. 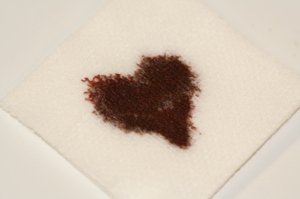 Occasionally, while preparing to inject a knee or shoulder, my proviodine splatter will form the shape of a heart. A pleasant midday happenstance, reminding me of how lucky I am to be with the woman I married. Yes it's a repost from previous years, but it never gets old. I came across a curious drug side effect recently which had me wondering about our management of Raynaud's and scleroderma. By far the most effective drug for Raynaud's phenomenon is nifedipine (adalat or procardia) and virtually all these patients try it at one time or another. Unfortunately, one of my patients recently developed fairly severe gingival hyperplasia after several months on the drug, bad enough to discontinue it even though it was highly successful for his raynaud's. I hadn't been aware of this side effect and neither were my rheumatology colleagues. The literature however, (mostly dental literature) clearly shows that this is a well known and not uncommon side effect of nifedipine, as well as other calcium channel blockers. In fact, it is one of only three drug groups which do cause gingival hyperplasia, the others being dilantin and cyclosporine. The oral side effect itself was bothersome enough, but what had me feeling a little uneasy was the fact that we were giving a pro-fibrotic drug to scleroderma patients, a fibrotic disease. Is it possible that these drugs might make the disease worse? Gingival hyperplasia with nifedipine was first reported in 1984. Subsequent studies, mostly in the dental literature have given highly different rates of hyperplasia with nifedipine, from as low as.5% and as high as 80%. The mechanism has yet to be figured out and is likely multifactorial. There does seem to be increased collagen production from fibroblasts but also decreased neutrophilic phagocytosis and clearance. The gingiva would be highly susceptible to the latter because of it's very high turnover of collagen deposition and removal. In fact, it seems that only gingival tissue is effected, , and this would certainly be good news for our patients. Still, I did find one article suggesting that rat myocardium had increased collagen deposition with nifedipine use and it might be worth researching the effects of nifedipine in normal skin tissue and scleroderma patients. Overall then it seems unlikely that nifedipine would cause anything more troublesome than gum disease , but even this side-effect should be more widely known amongst rheumatologists. Today I was at a rheumatology conference, meandering through a poster session display, hoping to see old friends from the rest of the country and maybe even discover some groundbreaking practice-changing rheumatological science. Well, I did meet the old friends. I was glancing over an interesting poster about the high rates of RA in native americans when somebody tapped me on the shoulder. I turned to find a young woman, completely unknown to me, smiling with a slight timidity that ruled out drug rep. She explained to me that she was a rheumatologist, just starting her practice at a local children's hospital. She wanted to say hello because when she was a medical student, doing her ER rotation, I had apparently taken the time to go over an interesting case with her. She explained that it was that interaction that set her off on her future course. That's all, just wanted to say thanks. I didn't remember her, nor the case. But I will now. It's not often that one gets such gratifying feedback, a real day-maker. We forget what impact we might have on the medical students and residents we train. If one interaction in a busy ER can influence career choices, imagine the effect of a month on a teaching service. Kind of scary really. Merckenary. Doctor of Fortune. Your Misfortune. Mercenary doctors, or what I call Merckenaries, are those physicians who do the bidding of pharmaceutical companies for cash. They come in many forms and we could easily debate for ages on when the line is crossed from MD working with pharma to MD working for pharma. Some say there is no difference. Personally, I think there are ways to work with the industry without crossing the line. If the process is good for the patient and fair for the MD, I am less worried that the company might profit too. But some behaviour is so obvious that it joins the Merckenary ranks without discussion. Because of the long waiting list at our clinic we are not able to see patients with chronic back or neck problems. Please consult a rheumatologist at another clinic, an orthopaedic surgeon or physiatrist. I'm sure that this physician hasn't seen a naked spine in over a decade, yet oddly feels comfortable accepting speaking fees as an expert clinician. Not just a Merckenary, a Merckenary with officer potential.